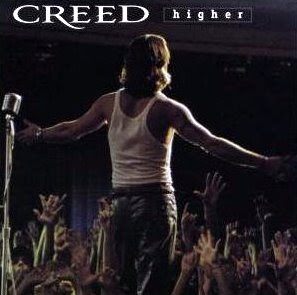 Kingdom of God Media: Creed -- "Higher"
Creed's song, "Higher," is an expanded version of the simple prayer "God's kingdom come." These lyrics come from the heart of one who has experienced God's grace and yet must continue to live in this fallen world. If we are God's people, then we are waiting for eternal rest and yet we are also experiencing heaven right now. The fullness of God's Presence is something much more real than a dream and yet, for expression's sake, this adequately describes the heavenly foundation of God's kingdom right now as it is on earth. Only His enlightened ones, who have been taught by His Spirit, are really aware of Him and His word among us. God allows his people to escape the futility of death, but we still must live on earth for a while. We can, at least, live at peace knowing that the purpose of our everyday lives has eternal meaning in Christ. There is a new thirst and hunger that God instills in His people that only He can fulfill. It is a conscience-clearing hunger. It is the rightest, richest kind of hunger. The fact that Creed performed this song hundreds of times in front of all kinds of audiences is awesome. I appreciate the fact that this band made God's truth available to so many people. seeker's heart. As a major bonus, he fulfills his seeking desire while bringing a significant dose of godly truth to the world. He was strategic to keep from being labeled "Christian;" he knew that such a connotation would be primarily religious and therefore detrimental to any genuine, spiritual progress. This would have only hampered his ability to perform in the mainstream music scene.